Xeric (trailing) forest range limits are particularly vulnerable to impacts of predicted climate change. Regional modelling studies contribute to the identification of potential local climatic threats and may support appropriate management strategies. 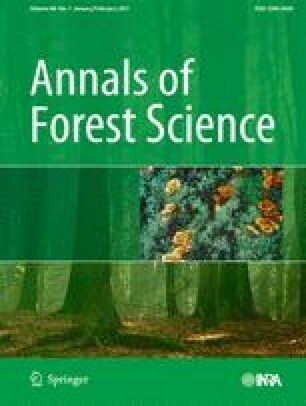 We carried out bioclimatic distribution modelling of two climate-dependent, dominant tree species, beech and sessile oak, to determine the most influential climatic variables limiting their distributions and to predict their climate-induced range shifts over the twenty-first century in the forest-steppe biome transition zone of Hungary. To exclude confounding effects of edaphic conditions, only data of zonal sites were evaluated. For both species, temperature and precipitation conditions in late spring and summer appear as principal variables determining the distribution, with beech particularly affected by summer drought. Projections from the applied fine-scale analysis and modelling results indicate that climate change may lead to drastic reduction in macroclimatically suitable sites for both forest types. Regarding the stands in zonal position, 56–99% of present-day beech forests and 82–100% of sessile oak forests might be outside their present bioclimatic niche by 2050. Phenotypic plasticity, longevity, endurance of non-zonal stands and prudent human support may brighten these dire predictions. Nevertheless, an urgent adjustment of forest management and conservation strategies seems inevitable. The support of the National Research and Development Programs (NKFP 6/047/2005, TÁMOP 4.2.2) of the EU Network of Excellence “EVOLTREE” and of the Hungarian Academy of Science (Supported Research Unit on Production Biology) as well as the detailed and founded critics of three anonymous reviewers is gratefully acknowledged.